How do I formulate an appropriate review question?What's the best way to manage my review?How do I develop my search strategy?How do I get started with data extraction?How do I assess the quality of a study?How can I analyse and synthesize my data?How should I write up the discussion and conclusion sections of my dissertation or thesis? "Placing myself in the capable hands of this trusted guide allows me to draw on practical tips and concise explanations without the nagging fear that I've missed something. If you want to travel light, unencumbered by unnecessary baggage, making steady progress to successfully complete your very own systematic review journey then climb on board!" Insightful, pragmatic and student-centred. This user-friendly guide will help students build confidence and skills while maintaining enthusiasm through their whole research journey. It's like having the map to finding a buried treasure! 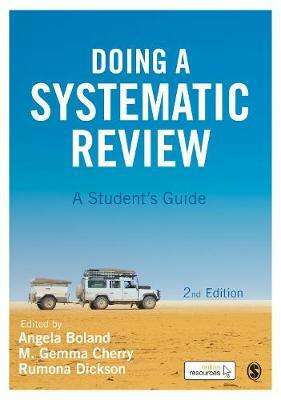 This book offers a blueprint for successfully and easily conducting a systematic review. The authors present the material in a clear, relatable and comprehensible manner enabling even the novice student to navigate the sometimes murky waters of the review process. This book is a MUST in the arsenal of every masters and doctoral student conducting systematic reviews, and will likely be pulled from the bookshelf time and time again.